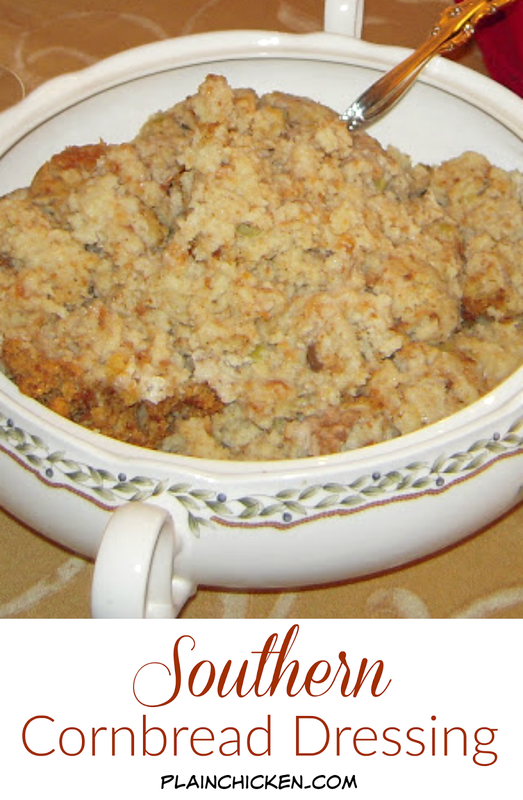 Southern Cornbread Dressing - My Mom's recipe for THE BEST dressing! SO easy. Homemade cornbread, white bread, celery, onion, cream of chicken, cream of mushroom, chicken stock, salt, pepper and sage. Bake along with bone-in turkey. I could just eat this for Thanksgiving and be happy! This is our favorite part of the holidays - my Mom's dressing. I don't like turkey, but I LOVE my Mom's dressing. It is especially good smothered with gravy! The original recipe came from my Dad's Mom. She was a great cook and made one of my other all-time favorite meals - Chicken Tetrazzini. My Mom has perfected the dressing recipe over the years. Chicken Legs can't get enough of this at the holidays. He especially likes it reheated at about 10:00 pm on Thanksgiving or Christmas night. Chicken Legs swears this is the best dressing you'll ever eat - I agree! Click here for the cornbread recipe we use in the dressing. Chop onion and celery in food processor. Crumble cornbread and bread. Add remaining ingredients (except turkey). Stir well. Place dressing in turkey roasting pan, top with turkey breast. Cover dressing with foil (leaving turkey breast uncovered) and bake at 350 until turkey breast is done - about 2 hours. We’ve been on the road without wi-fi access since Monday morning, so I’m behind in my blog reading. I'm with you guys and live for the dressing - your mom's recipe sounds and looks sooo good and I really like the idea of cooking it under the breast - especially since it's the part Bev wants. The dish below also looks outstanding and both went onto the try list. I´m all about the dressing too. Still finding "my own"... but this is a good idea! Thanks for sharing. I love your blog, your ideas are great!! Hey that's a good idea doing the breast on top! And, of course, it looks and sounds amazing. Happy Thanksgiving!! My favorite of all is the dressing, gravy and cranberry sauce...If I never had another piece of turkey, I wouldn't care. What the heck don't we make dressing more the rest of the year? I think it is everyone's favorite. I would love a big bowl of this comfort right now. Fantastic ideas. We make dressing several times a year...we both luv it. That looks wonderful! Just wondering if you seasoned the turkey with anything? We usually inject our turkey with Cajun seasoning but if I made it with the dressing in the pan would that ruin the flavor of the dressing you think? Katherine - that is truly an old fashioned Thanksgiving! what recipe for cornbread do you use for this? I pour the dressing into the pan, cover totally with foil, lay turkey breast on top of foil and bake 2 hours. Cook the DRESSING for 2 hours, too??? bj - yes, put everything in the oven together and let it cook for about 2 hours. Check the turkey and make sure it is done. You might have to loosely cover the dressing with foil if it gets too brown. "I pour the dressing into the pan, cover totally with foil, lay turkey breast on top of foil and bake 2 hours. Cook the DRESSING for 2 hours, too?" So...you lay the turkey breast on top of the foil that is covering the dressing? Picture looks like it's laying on top of the dressing? If it is, do you just arrange some foil around the dressing to keep it from browning too quickly, letting only the breast to be exposed? I want mine to look as wonderful as your does in the photo!! Thanks for the help!!! cajuncutie - You just arrange some foil around the dressing after it has cooked for a while if you see if getting too brown. The dressing and turkey are baked together. approx. how big/how much did the turkey breast weigh? julied - yes, bake the cornbread first and tear it up. You want to dry the white bread out a little, but not toast it. Put it in the oven for a minute or in the toaster on the lowest setting. Tammy - we used a 5-6 pound bone-in turkey breast. Did you season the turkey with anything? The stuffing turned out great!!! It was very moist and still had plenty of juice from the turkey. Love this recipe! I am SO glad to hear that Joan! what if you dont want the dressing mushy but like browned on top some can you take foil off or what. Im a very new cook and not sure bout this and did you season the turkey breast? Why do you add the wheat bread? What can you use in place of the canned soup? not sure, this is the way we've always made it. this is very yummy but i had to cook another breast alone so i could make gravy. what do you do about stock for gravy? We buy turkey stock. Swanson has a limited edition turkey stock in the stores right now. i could also use stock i froze. i but carcass in crockpot with celery and onion and cooked on low for 8-10 hours. i froze it and it should work too i guess???? Do you think this recipe would work if I just baked the dressing separately without the turkey? Would I still bake it 2 hours? If you are going to bake it separately, add 1/2-1 cup more chicken broth, and I would probably bake it about an hour. Approx how many people does this serve? my mom's dressing is very similar, but she cooks her onion and celery in a stick of butter and a half a can of chicken broth, then adds it to the bread (we use all bread) with poultry seasoning, parsley flakes, and 2 eggs. she has always mixed it up in the top of an over turned Rubbermaid cake carrier :-D some goes in the turkey, some goes in the pan. i love them both! How many ounces of broth or what size can? I get the broth in cartons; it's much better. The recipe said 3 pans of corn bread or was that a type O and it should be one pan? Not a type-o. The recipe needs 3 batches of the cornbread recipe that I linked to. Enjoy! Stephanie, The recipe said to use 2 cans of chicken stock, but in the store, I think they all come in 16oz tall box, an how many do I need because I'm not going to add the turkey breast. I guest for the salt and pepper adjust to my taste? They sell 14.5-oz cans of chicken broth in the stores. I might add 1/4 to 1/2 cup more broth since you aren't baking with the turkey breast. Hi Stephanie, I used a 10 1/2 size can of cream of chicken and mushroom soup for the dressing and should I use a larger size or the 10 1/2 size is enough? I always use that size can. I'll update the ingredients so it is clear. Thanks! Have you ever roasted a whole turkey in the dressing instead of just a turkey breast? I was thinking of doing this in my roaster with a 9.5 lb whole turkey, but then was wondering if a whole turkey would create too much juice for the dressing. Yes - we’ve made a while turkey with this recipe too. It will work great. Enjoy! Thx, thats exactly what i will do. Appreciate the fast response. HI Stephanie! I’m late to this stuffing party but this is my first year hosting thanksgiving. I’m SO nervous. My family has always put the stuffing inside a whole turkey. Do you think that will work as well?? Yes - stuff Some in the bird and put the rest around it. Perfect!! Enjoy!